Liz's Paper Loft: MCT August Sneak Peek Day 1 ~ fangtastic! Hey Hey Hey it's Monday and Day 1 of My Creative Time August Release Sneak Peek! Today we are featuring a "fangtastic" stamp and die and a set of square stitched dies. Isn't Dracula is too stinkin' cute! First I stamped this fun image on my square, then I stamped it on a mask and cut it out. Next I colored the dracula, then place the mask over the colored image. Once I was sure the mask was securely attached, I inked the background with distress ink. Using several colors of blue to create the depth. After the background was dry, I added white gel "stars". We are inviting you to join our new "My Creative Time INSPIRED" group! We will ALL be able to inspire each other with all of our MCT inspired projects, there will be occasional giveaways & impromptu challenges! Please share with all of your crafty friends so they won't miss out on a thing! Let's start sharing......ready...set...GO! Your cute sweet little treat bag is super adorable! This is a great treat bag topper!! I love the awesome night sky background and how this vampire looks like he's ready to go out on the prowl! Awesome job! TFS! WOW! Cute,cute treat topper. Love all the colors and design. This vampire stamp/die set is really neat. 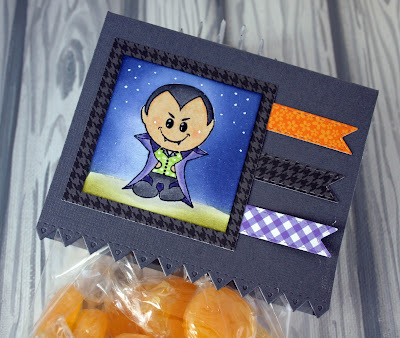 Super treat bag!Little vampire is such a cute freebie and I can see how fun he will be to add to many projects. Love the new stitched square dies inside and out too, they also will be so versatile in making various projects. Can't wait to play with it all. lol TFS Linda adnilttoh@gmail.com Think the square dies could easily be the go to for all the many different projects being made. You really outdid yourself. He's cute and the background is gorgeous in color. OMG Miss Liz what an awesome gift bag topper your coloring is fabulous and you sure did a super outstanding creative job and OMG Lucky coworkers!! You come up with the neatest ideas. YOU so ROCK!! First, how sweet you are to make treat bags for your co-workers: so thoughtful! Second, what amazing toppers you've created! Your showcase of the handsome little vampire is fabulous. The starry scene you've created for him is such a marvelous special touch! In awe! OMG this is so AWESOME Liz!!! Such an adorable treat topper!!! Love all of the colors you combined and the different dies! Thanks for the neat idea!! I love your ADORABLE treat bag!!!!! :) I'll have to pull out my Chocolate Greetings Set to make those cute fishtail banners! How do you keep your (many!) stamps and dies organized so that you remember to use these oldies but goodies?! Thanks for sharing your thoughtful creation! Love the treat topper. Your friends will love it. It would also make a great card. I'm loving the stamp set more and more. Cute design. I like the little banners. Love the creative details in your card (edging , white dots, banners). Love the vampire! He would look fab on anything especially your treat bag. This little guy is way cute, very cute project. Thanks for sharing! 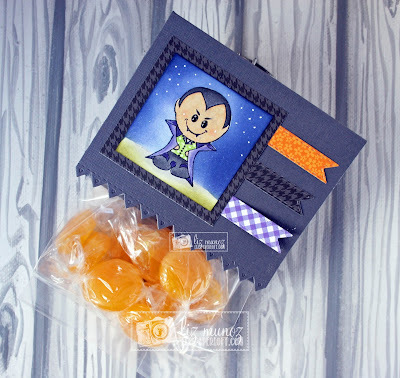 Oh, great idea - perfect Halloween treat bag topper! So clever! TFS! Your background turned out so cool Liz! Great job with it! I'm sure your coworkers will totally love these treats!! LOVE your background and colouring! Your little vampire looks AWESOME! OMG! That background is awesome! Love the color depth of this card - totally eye catching! Super cute Liz! 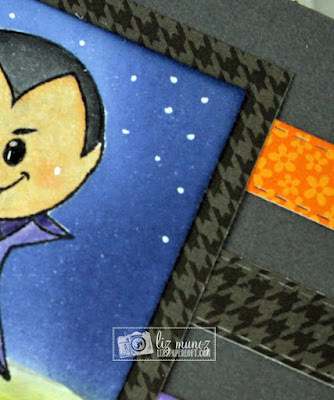 I love the stitched dies and the freebie vampire is adorable! Can't wait to start on fall projects! Your vamp card is so adorable...great inking job and coloring. Your co-workers must look forward to your treats. Wonderful job. Your treat bag is ADORABLE .... I have kids who do Halloween so I think this is such a great idea. LOVE IT!!! LOVE your background!!! Ill be making this card!!! love it!! Love your super cute treat topper:) Thanks for the inspiration! What a cute treat bag. Your co-workers are going to love it!! Thanks for sharing your cute treat topper. Oh my gosh, this is too fantastic to be a treat topper; so detailed and beautiful! Love it! This card is just so cute! He really is great and I love the background colors. Nicely done!! Such a cute treat topper! Your co-workers will love these! Cutest little treat topper! Just darling, Liz! Liz ~ oh my this is seriously AMAZING! LOVE what you did with the vampire and oh the background! FABULOUS as always!